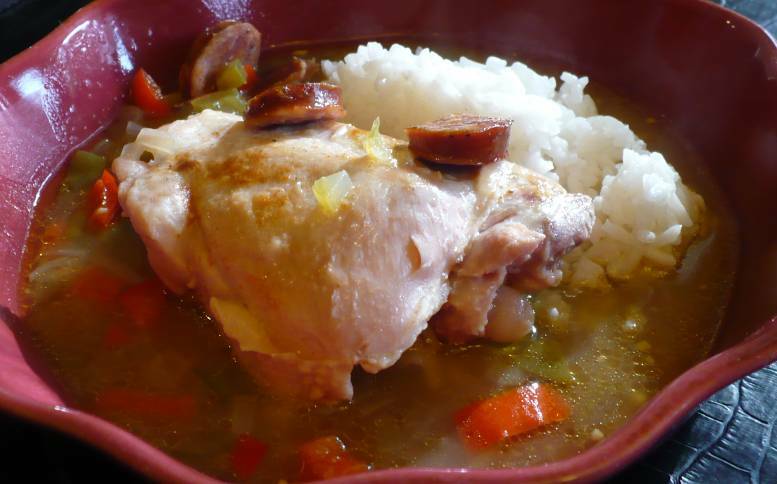 For day #14 of Soup Month we made this delicious Chicken and Sausage Gumbo. The Andouille sausage brings a deep blend of spices to this dish and blends great with the chicken thighs. While the Heineken beer was quite tasty, a dark Bock beer would bring an even deeper flavor and I will probably try that the next time we cook this dish. Everyone gave this a thumbs up so we will be making it again soon. The photo does not do this dish justice and we will be adding a new photo on the next try! Combine flour, oil and butter in a large soup pot. Cook over medium-high heat, stirring often, about 10-15 minutes until the mixture just begins to brown. Meanwhile, bring broth and beer to a simmer in a medium saucepan. Keep warm over low heat. Season the chicken thighs with 1/2 tsp salt, garlic powder and 1/2 tsp ground red pepper. Add chicken to the soup pot and brown until both sides are seared golden brown, but not cooked thru. Add the sausage, onion, peppers, celery, garlic, bay leaves, black pepper and remaining salt and red pepper to the soup pot. Stir well. Slowly add the hot broth and beer mixture to the soup pot, stirring constantly to prevent any lumps. Bring soup to a simmer, cover and continue to cook at a low simmer for about 90 minutes. Remove and discard bay leaves. Place a scoop of rice into each of 6 bowls and top with the soup mixture and 1 or 2 of the chicken thighs.